A cool-looking, functional transport tool with nine gallons of storage and fuel injection. Looking for the fun way to zip around town? Looking for a scooter with lots of storage space? Looking for an affordable yet environmentally responsible form of transportation? Look no further…, Your search is over. Check out the 2010 Yamaha “C Cubed” 50cc, 4-stroke scooter that is easy on the wallet, laughs as it passes gas stations and is a blast to ride. The 2010 C3’s trendy box design highlights the 9 gallons of cubic storage space. 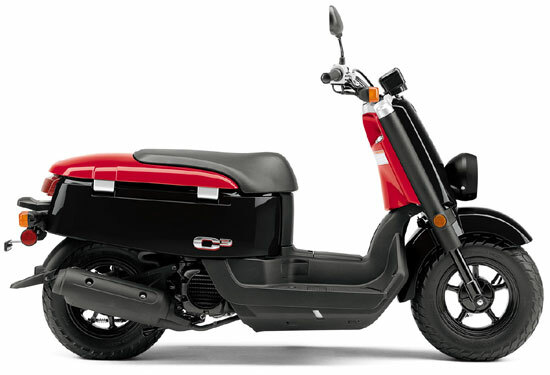 You also get a fuel injected engine, big tires on cast aluminum wheels, and motorcycle type fork and handlebar. 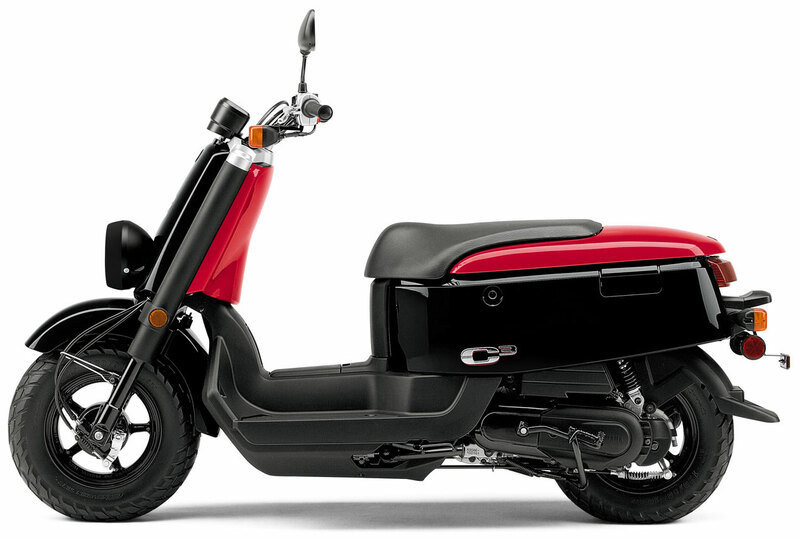 ” Trendy “box” design scooter accentuates cubic space-hence the name C3-while it stresses function and simplicity. ” Completely modern running gear, including a fuel-injected engine, makes this one super-economical to operate. The C3 will take you a long, long way on a single 1.2-gallon tank of gas. ” High-function features include big tires on cast aluminum wheels, a motorcycle-type fork and handlebar. ” Side-hinged, locking storage compartment swallows up to 9 gallons of gear. ” The C3 achieves fuel economy up to an estimated 115mpg* with a fuel tank that holds 1.2 gallons of gas. ” Liquid-cooled three-valve, four-stroke engine is powerful, quiet and low-maintenance. ” Electronic fuel injection: a 19mm Mikuni® throttle body provides optimal mixture in all conditions and easy cold starts. ” The C3 will take you a long, long way on a single 1.2-gallon tank of gas. ” Fully automatic V-belt transmission provides easy, twist-the-throttle-and-go operation. ” Pushbutton electric starting (with backup kickstarter) gives ultimate ease of operation. ” The air-induction system and exhaust catalyst technology reduce air pollution. ” Fat, 120/90-10 front and rear tires offer excellent traction and rugged looks. ” Large-diameter steel-tube frame provides strength, long life and great handling. ” Hydraulic motorcycle-type front fork with 2.3 inches of travel delivers a smooth ride. ” Motorcycle-type handlebar can be swapped out easily for a different bend or style. ” Unlike most scooters, the front apron turns along with the fork for style and function. ” Wide, comfortable seat is only 28.9 inches from the pavement. ” The 9-gallon locking underseat storage is perfect for hauling backpacks, groceries, or whatever. ” Retro/functional style is designed for individual customization. ” Cool instrument display provides a speedometer, odometer, fuel gauge, high-beam indicator light and engine management indicator lights. 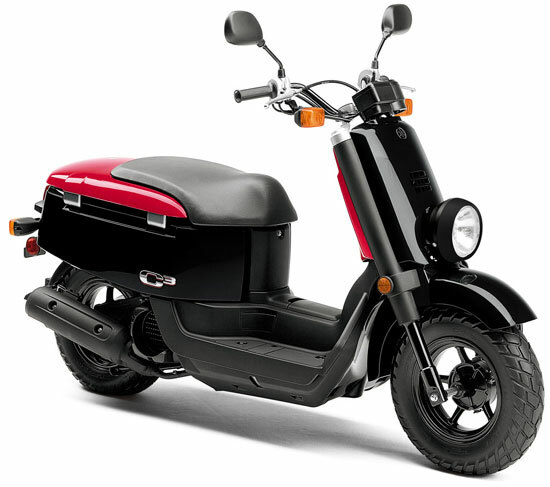 ” Peppy, 49cc, liquid-cooled (with fan assist), SOHC, 3-valve, fuel injected, 4-stroke engine produces lively, predictable power with incredible fuel economy. The concept of this environmentally friendly engine is strong performance with low noise, low emissions and great fuel mileage. ” Fuel consumption of 49 kpl or 138 mpg. Your actual consumption may vary. ” Easy, dependable electric starting with backup kick starter. ” The cylinder features a ceramic composite coating which insures uniform heat dissipation, reduced friction and an extended service life. ” Three valve cylinder head design utilizes two intake valves and one exhaust valve. The dual intake valves allow for the efficient flow of fuel and oxygen into the engine for increased power output. ” Rocker arms are used to actuate the valves. These specially designed rocker arms reduce both friction and mechanical noise for a quiet, enjoyable ride. ” Liquid-cooling with fan assist is used to maintain stable engine temperatures even during stop and go city riding. Liquid-cooling allows for a higher state of tune for increased engine performance. Liquid-cooling also reduces engine noise. The radiator is positioned longiitually in the frame next to the engine. ” Crankcase-sump type oil delivery system is utilized. A special centrifugal (rotary) oil filtering system is employed. This type of oil filtering system automatically removes any particles found in the oil and eliminates oil filter changes. Oil changes should be performed every 3,000 kms. ” 19mm Mikuni throttle body fuel injection system features unified sensors for the throttle position sensor (TPS), intake temperature and pressure. These sensors are linked to the ignition system and provide feedback to provide crisp throttle response. Since this is a fuel injection system, it means there is no choke or idle adjustment to worry about … it is all controlled automatically. ” Easy access, paper-type air filter is used. Total air box capacity is 2.1 liters for excellent performance and reduced intake noise. The air filter is a high flow-type with an extended service life. ” Fully automatic, V-belt centrifugal transmission ensures easy “twist-the-throttle-and-go operation”. There is no clutch or gear shifting to worry about. A wide range reduction ratio is used for peppy performance. ” Maintenance-free T.C.I. ignition system with 2-D mapping provides a precise, high-voltage spark for fast starts and crisp engine performance at all rpms. ” High output 130 watt generator supplies plenty of electrical power. ” Air induction system (AIS) is used to further reduce harmful exhaust emissions. The AIS system injects oxygen into the exhaust to ensure complete fuel combustion, thereby reducing both hydrocarbon (HC) and carbon monoxide (CO) emissions. ” Environmentally sensitive exhaust system and muffler produce a very quiet, friendly exhaust note. The muffler features dual catalytic converters to further reduce harmful exhaust emissions. ” Rugged, step-through, underbone-style, steel-tube frame provides stable, confidence inspiring handling. The open step-through design means it is easy to get on and off the “C Cubed”. ” Long 1280mm wheel base provides stable, relaxed handling characteristics and lots of room for the operator. ” Front and rear 110mm drum brakes supply strong, reliable stopping power. They are hand operated, for ease of use …. just like on a bicycle ! ” Rugged yet lightweight, die cast aluminum 5-spoke mag style wheels are fitted with wide, aggressive 120/90X10″ tubeless tires. 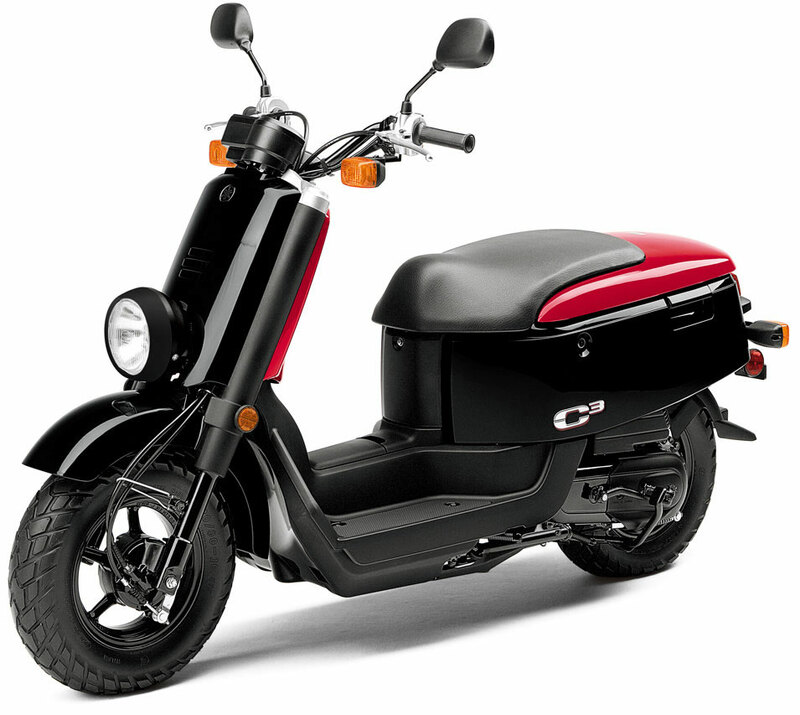 ” Long and wide single seat offers plenty of room and insures excellent rider comfort. ” Super convenient, large, 34 liter locking, under seat storage compartment can easily hold a half helmet or other items like a briefcase, laptop computer, umbrella, purse, jacket, change of shoes, tennis racket, Frisbee etc. ” Special helmet holder allows you to safely secure your helmet in front of the seat. Since the holder is located under the seat, the helmet can not be removed without first unlocking the seat. ” Large 4.5 liter fuel tank means lots and lots of kilometers between fill-ups. The locking fuel cap is located below the floorboard under a small easy access panel. Electric dash mounted fuel guage. ” Large size 35/35-watt multi-cut lens halogen headlight maximizes nighttime illumination and day time visibility. It also adds a unique styling touch. ” Full-size floorboards and wide, stylish front apron provide excellent splash and wind protection and highlights that unique “lets have fun” styling. ” Easy to read speedometer assembly features an integrated electric fuel gauge. Large size digits are very easy to read. Other functions include high beam indicator, turn signal indicator, coolant temperature warning and engine diagnostic / trouble warning lights. ” Ultra convenient, anti-theft main ignition switch serves two purposes. Not only does it control the ignition, but is also locks the steering. By using a special “tab” on the ignition key, you can slide a cover over the tumbler area of the ignition assembly which prevents someone from tampering with the ignition switch.